Mary Gocek (American, now married and using a different name), Elzbieta Gocek (Polish, now married and using a different name) and I (Gary Gocek, American) have pieced together a portion of the Gocek family that accounts for many of the Goceks in the United States today. Jan Gocek and Maria Berechowska married in Czaszyn (southeastern Poland near Sanok) in the early 1800s. They had at least four sons, Andrzej, Walenty (Gary's great-grandfather), Jakub (Elzbieta's great-grandfather) and Anton (Mary's great-grandfather). During the time of Jan's life, the Czaszyn Goceks were primarily laborers and farm workers, i.e., are not known to have descended from royalty or feudal landowners. Jan's son Walenty married Katrzyna Fal, whose surname is listed in the 1787 Austrian Cadastral Records. Historically, a "cadastral survey" is a list of landowners and property measurements compiled for tax purposes. Jakub's branch remains in Poland. Walenty and Anton immigrated around 1900 to Syracuse, NY, USA. We probably came across Andrzej's name on a marriage license or immigration record, and I believe he immigrated to the USA. Julian (Gary's father) saved several obituaries and mass cards which may be seen here (PDF). A photo of the house where in Czaszyn where Walenty's son Jan lived (and presumably Walenty). Photographed in 1990. "Gocek" defined on Wiktionary (with etymology). The Polish pronunciation of our name is gawt'-sek. American Goceks generally do not trace their ancestry to Turkey, although a city in southwestern Turkey bears the name of "Göcek". Most American Goceks trace their ancestry to Polish immigrants who arrived around the turn of the 20th century. We have not encountered widespread alternate spellings. The most common American pronunciation is go'-sek, with occasional instances of go'-check. Gary Gocek, with Gary's sons Greg and Dan, Gary's parents Julian and Joan and Gary's sister Gretchen visited family grave sites on August 3, 2008 and recorded some information for the benefit of future visitors. Photos below were taken that day. Some photos are of nearby graves for landmarking purposes, and are not related to our families. 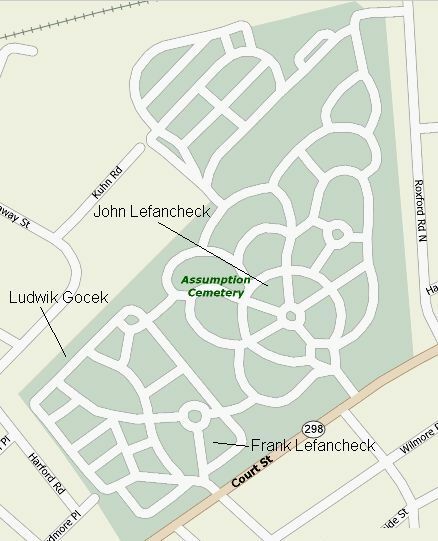 Assumption Cemetery is entered from 2401 Court St., Syracuse, NY 13208. Joan's father's father John is buried in Section C with John's wife Rosalia, brother Otto, and sister Anna Lefancheck Janack. Anna's site is unmarked (not sure why) and was buried with her parents at Walter's request. John's brother Frank is buried in Section 2 with his wife Bertha. Frank and Bertha are in the middle of Section 2 near a mausoleum for Principiato. There is a standing stone for them, as well as a flat stone that mentions Frank's WWI service. Julian's brother Ludwik is buried in Section 7-M with a space reserved for his wife Regina. The original Sacred Heart Cemetery (not to be confused with a newer Sacred Heart Cemetery) is entered from 140 Salisbury Rd., Syracuse, NY 13219. Julian's father John and mother Fanny are buried up the hill on the right after entering from Salisbury. Look for the water faucet on the left just before reaching the chapel. Across the street from the water faucet, this Gocek grave is well up the hill. 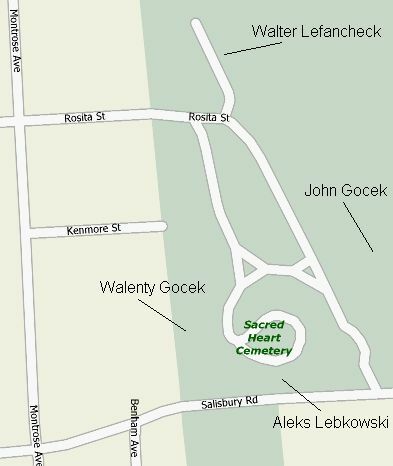 John Gocek's father Walenty is buried on the far opposite side of the cemetery from John, almost to the back fence. On Walenty's marker, the reference to "Marya" is a reference to the Blessed Virgin. Joan's father Walter and mother Sarah are buried along the right side of the entry road; bear right at the fork and go almost to the cul-de-sac. Regarding the graves of Sarah's father Aleks Lebkowski and mother Ewa: there is a tall spire in a circle, to the left and above the entry road. Back across the access road, between the access road and Salisbury, are the graves. In this area, also, are Aleks' son Richard and Richard's wife Jane, Aleks's son Martin (close friend of Walter Lefancheck), and Walter and Sarah's baby son Donnie. Donnie is in an unmarked area behind Teodozia Zalewska (not a relation). Also here is Roman Dargel (known as Ray); Ray was the first husband of Aleks' daughter Felicia. Felecia is buried elsewhere with her second husband Mike Szymanski. Aleks' daughters Rose and Lucielle are buried in this Sacred Heart Cemetery (but we didn't track them down for this report). Aleks' daughter Harriet is buried in Florida. 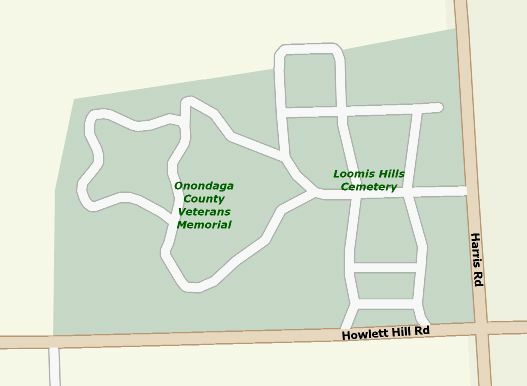 The Onondaga Country Veterans Memorial Cemetery is located at 4069 Howlett Hill Road, Syracuse, NY 13215. Julian is buried in section L, row 2, grave 25. Joan Gocek plans to be buried there. 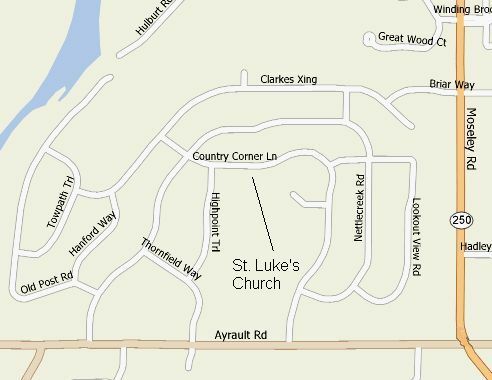 St. Luke's Episcopal Church is located at 77 Country Corner Lane, Fairport, NY, 14450. A columbarium for ashes is located inside the church on the lower level. Gary Gocek and Susan Pines Gocek plan to have their ashes kept there. No crypt has yet been chosen. Assumption Cemetery, near Frank and Bertha Lefancheck. Assumption Cemetery, near John and Rosalia Lefancheck and Anne Lefancheck Janack. The urn is part of the Lefancheck plot. Assumption Cemetery, near Ludwik (and someday Regina) Gocek. Sacred Heart Cemetery, near Aleks and Ewa Lebkowski, Richard and Jane Lebkowski, Martin Lebkowski, Donnie Lefancheck, Roman Dargel. Sacred Heart Cemetery, near John and Fena Gocek. Sacred Heart Cemetery, near Walenty Gocek. Sacred Heart Cemetery, near Walter and Sarah Lefancheck. Onondaga Country Veterans Memorial Cemetery, near Julian and (and someday Joan) Gocek.